Lindt Chocolat Cafe hostage drama..
Mr Scipione said the siege does not appear to be linked to terrorism arrests this morning. He said police were treating the siege as a hostage situation at the moment, but were prepared to escalate their response if needed. "We have not yet confirmed this is a terrorism-related event," he said. Mr Baird said: "We are incredibly proud of this city, the values we hold dear … I am very confident and thankful for the police and their activities. From what I’ve seen today, we’re very lucky to have them. "This is an event that is obviously testing all of us here in the city … The important message is we have all the activities in hand, we are dealing with it and it’s best that we get back to it." 2:03pm: Mr Scipione said there are hundred of police in the CBD, and there will be more officers sent out if needed. He said that police were working hard to find out the number of hostages being held. Police are still trying to work out the meaning of the flag that has been held up in the cafe window. 1:59pm: Mr Scipione said there is no suggestion of what motivated the siege at this stage. "We still determining what it is that may well be the motivation. We are not in a position to determine where the individual is from." 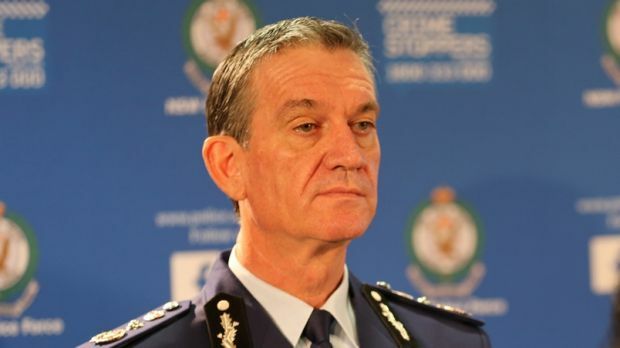 He said: "My advice is that we haven’t had contact with the armed offender at this stage"
NSW Police Commissioner Andrew Scipione: "This is a diffucult day for eveyone involved"
He says there is an armed offender holding an undisclosed number of hostages. "We want this matter to end peacefully." There are no other incidents related to the siege in Sydney, he said, and people shouldn’t be afraid if they see the police in their neighbourhood. Premier Mike Baird addressing the media: "We are being tested today in Sydney. The police are being tested, the public is being tested, but whatever the test we will face it head-on and we will remain a civil, democratic socieity." 2GB radio host Ray Hadley claims he has talked to one of the hostages in the Lindt cafe, who was speaking on the phone under instruction from a gunman. Hadley said he did not broadcast the conversation because it wasn’t in anyone’s best interests. He said he had been told to ring the number back soon. He said the gunman was "talking about other operatives being involved". "I could hear the person in the background giving instructions to the young man I was talking to. The young man, remarkably, was quite calm, quite calm, and he was quite happy for us to have his phone number and said ‘I want you to ring me back in 10 minutes for further instructions from the man holding us hostage’." 2GB broadcaster Ray Hadley claims to have spoken to a hostage in the Lindt cafe. Michael was customer number 183. It is a fact that separates him, by about 15 minutes, from some of the Lindt Cafe customers now being held hostage in Martin Place. "The guy who served me… no doubt [is] being held hostage, which is tragic," he says. Michael says it was a relatively quiet morning when he placed his 9.22am order before lingering in the cafe for a few minutes after running into a client. "It wasn’t what I would consider to be busy," he says, noting there were about 15 to 20 people, including a cafe staff of at least four at the time of his visit. By contrast, he says the number of hostages could have been far higher if the situation had unfolded 24 hours earlier. A barrister from the building’s 8th Floor Garfield Barwick Chambers, Michael says the cafe was packed with people for the weekend pre-Christmas rush when he stopped into work on Sunday. "There was a queue out the door," he says. "If they had gone in even at 8.30 [this morning], it would have been a lot busier because a lot of people get their stuff before they go to 9 o’clock work." 1:34pm: NSW Police Commissioner Andrew Scipione and NSW Premier Mike Baird are about to address the media. 1:33pm: More detail on what’s happening in Sydney public schools: A NSW Department of Education spokesman said all public schools within a 1km radius of the CBD were in "lock-out" mode, which prevents anyone from entering the school or children leaving. Any other schools outside this exclusion zone could make the decision to implement lock-outs if they felt it necessary, he said. 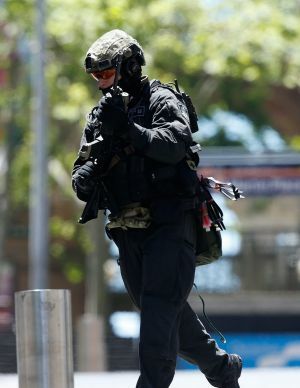 1:32pm: From James Robertson, our reporter in the CBD: Police presence around State Parliament and minister’s offices was increased about two months ago following intelligence of an increasingly likely terror threat, according to a parliamentary source. The number of constables on duty at Parliament at any time was nearly doubled to 20 and no-stopping zones were introduced around Parliament’s perimeter. The state government ministers only months ago moved into 52 Martin Place, diagonally opposite the siege scene. A police officer at the scene of the siege. 1:29pm: Here’s a recent photo from Fairfax photographer Daniel Munoz from the scene of the siege. This is from Deputy Technology Editor Ben Grubb: Despite Channel Seven reports that mobile phone services have been shut down in the CBD at the request of police this is not the case. "There is no disruption to Optus’ mobile network in the Sydney CBD. Customers’ voice and data services are operational," an Optus spokeswoman said. Telstra and Vodafone spokespeople would not comment, although it’s understood they have not shut down services either. The issues may be related to congestion from people posting photos to social media using the mobile networks and making calls at the same time. NSW Police is yet to comment on whether it is using any mobile phone jamming equipment, although use of such equipment is illegal unless approved by the communications regulator, the Australian Communications and Media Authority. 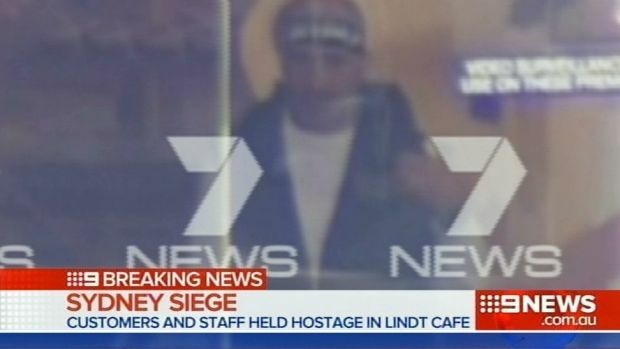 1:16pm: Channel Seven earlier broadcast this image of a man inside the Lindt cafe. The Department of Education and Communities Safety and Security Unit has notified some public schools of the hostage situation.The schools have been asked to assume ‘white level’ lockout which means no school group is to leave the school grounds. 1:02pm: Mr Abbott: "This is a very disturbing incident. I can understand the concerns and anxieties of the Australian people at a time like this but our thoughts and prayers must above all go out to the individuals who are caught up in this." "I can think of almost nothing more distressing, more terrifying than to be caught up in such a situation and our hearts go out to these people." Mr Abbott finishes his press conference and takes no questions. 1:00pm: Mr Abbott: "We have to appreciate that even in a society such as ours there are people who would wish to do us harm." "That’s why we have police and security organisations of the utmost professionalism that are ready and able to respond to a whole range of situations and contingencies." 1:00pm: Earlier, groups of people were evacuated from a nearby building, climbing down several ladders. 12:58pm: Mr Abbott: "The whole point of politically motivated violence is to scare people out of being themselves." Mr Abbott says "there are some indications" the incident might be politically motivated." 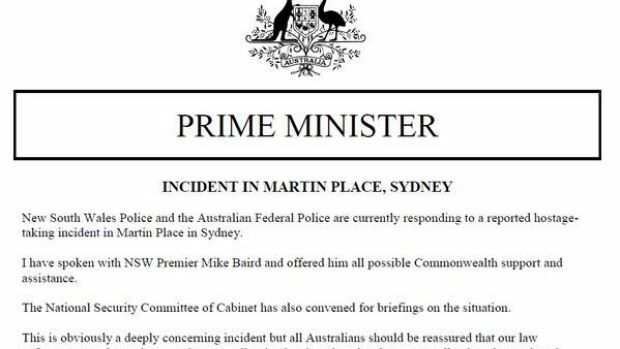 The Prime Minister praises police and urges Australians to go about their business as the Martin Place stand-off continues. 12:57pm: Mr Abbott says the National Security Committee has been briefed. 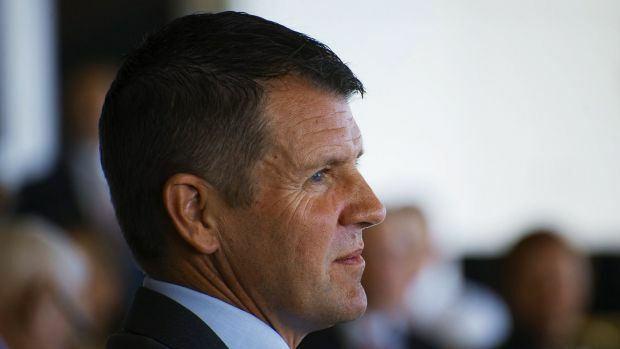 Mr Abbott has spoken regularly to NSW Premier Mike Baird and also to the Australian Federal Police. 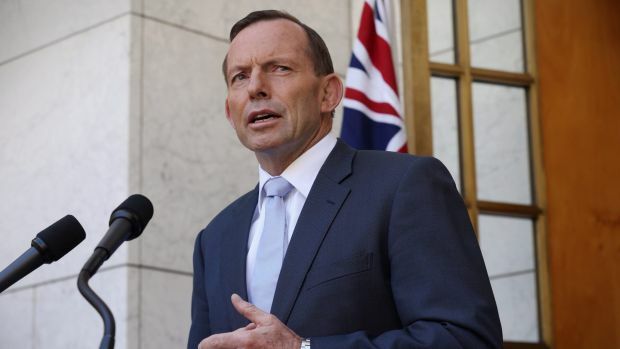 "I urge everyone to exercise caution in their reporting," Mr Abbott says. "I will leave all of the operational details to the NSW Police." 12:55pm: Mr Abbott says the business of government must go on. The Mid Year Economic and Fiscal Outlook will be released shortly. 12:55pm: Mr Abbott: "Australia ia a peaceful, open and generous society. Nothing should ever change that." Mr Abbott urges people to "go about their business as usual." Mr Abbott says if anyone sees anything suspicious they should report it to the national security hotline – 1800 123 400. 12:53pm: Prime Minister Tony Abbott is speaking at Parliament House in Canberra. "We don’t yet know the motivation of the perpetrator. We don’t know whether this is politically motivated." "There are some indications it may be." 12:45pm: Several high-profile sporting events scheduled for Monday have been affected by the siege in the CBD. The launch of the NRL 2015 season draw and the launch of Netball Central – the new Netball NSW centre in Homebush – among others, have been affected by the events unfolding at the Lindt Chocolat cafe in Martin Place. 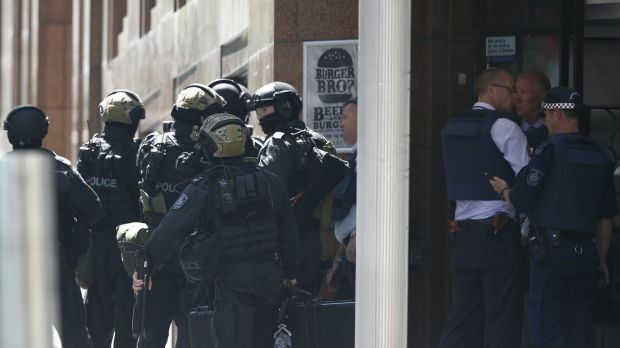 12:33pm: A NSW Police spokeswoman says it appears the arrest was NOT related to the siege. 12:32pm: Opposition leader Bill Shorten has released a statement saying his "thoughts and prayers today are with the innocent people involved in this morning’s incident in Martin Place, Sydney". "Our thoughts are also with their families who are seeing this incredibly distressing situation unfold." "I have full confidence in the skill and professionalism of our police and security agencies." Mr Shorten has spoken with Prime Minister Tony Abbott and offered him the Opposition’s full support. "Australians can be assured that we are one when it comes to keeping Australians safe." 12:31pm: There are reports a man has been arrested 200 metres away from the Lindt cafe. It is not clear whether it is related to the siege. We are seeking clarification. 12:29pm: The federal government was to have released its Mid Year Economic and Fiscal Outlook to day but has decided it will delay the release of the information until a later date. The National Security Committee met earlier today. All citybound traffic travelling over Sydney Harbour Bridge is now being diverted via the Western Distributor. There is no southbound access to the Cahill Expressway, York Street or Harbour Street. There is no northbound access to the Cahill Expressway; all traffic is being diverted into the Sydney Harbour Tunnel. Northbound traffic on the Western Distributor cannot use the King Street exits; all motorists will be diverted over Sydney Harbour Bridge. Buses entering and exiting the city are also diverting and their route may change at short notice. This is part of a statement, sent from NSW Police earlier. "There is a police operation underway at Martin Place. Police and emergency services have responded and a number of streets around the area have been closed. The Martin Place train station is also shut. Police are dealing with an armed incident and specialist officers are attempting to make contact those inside a caf?. Some nearby offices have been evacuated as a precaution. Anyone else in the area encompassing Hunter, George, Elizabeth and Macquarie streets bordering Martin Place is directed to remain indoors and away from open windows. Anyone in the vicinity but outside that area is free to leave their buildings." Police urge members of the public to remain calm and note that an appropriate police presence is in place." The NSW Supreme Court’s criminal courts, and several city legal chambers. There were earlier reports on social media the Sydney Harbour Bridge was shutdown. That was not correct. There was an accident unrelated to the siege, which blocked some lanes. Chifley Square is also reportedly in lock down. Workers in the MLC building offices are unable to leave. Some workers are being evacuated to Hyde Park. This photo, by Peter Rae, shows an area near the NSw Supreme Court, about a block away from the Lindt cafe. All my thoughts and prayers are with those members of the public affected by the situation in Martin Place and the NSW Police who are trained to deal with these events. I have spoken to Police Commissioner Andrew Scipione and have full confidence the NSW Police are working effectively to resolve the situation. I will provide further information as appropriate. 11:40am: The full statement released by the Prime Minister’s office. 11:40am: From the Herald’s court reporter, Paul Bibby: The NSW Supreme Court’s criminal courts on King Street in the CBD have been evacuated, as has have scores of staff from the NSW Crown Solicitor’s office. 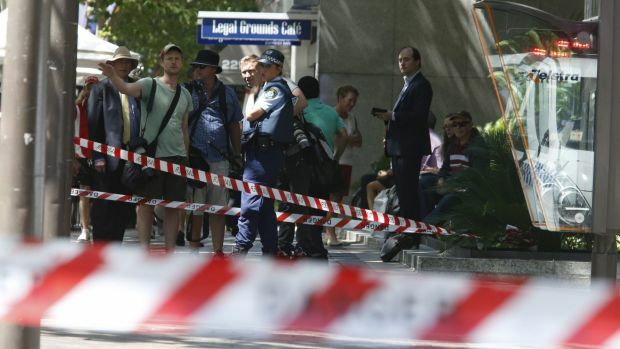 A number of prominent barristers chambers have also been evacuated, including the Seventh Floor Garfield Barwick Chambers in Martin Place and the Wentworth Chambers. Other legal chambers such as Sir Owen Dixon have been locked down, along with dozens of government and commercial buildings in the blocks surrounding the siege, including the Reserve Bank and the NSW Department of Transport. Some staff say they have been moved out of their offices to the "safe" side of their buildings away from the caf?. 11:35am: Sydney’s Muslim leaders have expressed their concerns and a number of organisations have offered to help in any way they can. The Prime Minister’s office sent this out moments ago: "New South Wales Police and the Australian Federal Police are currently responding to a reported hostage-taking incident in Martin Place in Sydney. 11:30am: The premises that houses the Lindt Chocolat Cafe was recently sold for $8 million, The Australian Financial Review reported. It said a prized retail asset in Sydney’s Martin Place had sold to an interstate private investor for $8 million. "The property, at 53 Martin Place in the city’s central business district, is home to the Sydney headquarters of high-end Swiss chocolatiers Lindt & Spr?ngli. "Miron Solomons and Matthew Meynell of Colliers International ?brokered the deal. "The entire 15-level heritage building fronting Elizabeth Street, Martin Place and Phillip Street, sold for $45 million in 2002." Hostages are being forced to hold an Islamic flag against the window of the Lindt Chocolat Cafe in Martin Place after at least one gunman stormed the premises, reports Megan Levy. 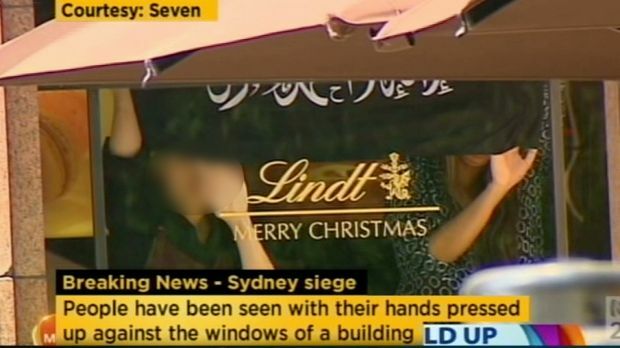 The flag shown being held by hostages against the window of Lindt Chocolat Cafe is not an Islamic State flag, but is an Islamic flag that has been co-opted by jihadist groups, reports David Wroe. 11:19am: Fairfax Media understands the federal government has convened a meeting of the National Security Committee this morning. It has been warning for months that a terrorism attack in Australia could happen. Prime Minister Tony Abbott said after the September terror raids, that all that was required for a domestic Islamic State-ordered terror attack was a "knife, iPhone and a victim". 11:17am: We reported earlier that Sydney air space was shut down. That is not correct. No Sydney sir space has been shut down, Air Services says. This is from James Robertson, our reporter in the CBD: "It was about 10 past 10. They [police] came out running like a madman and said close the shop! Get out!" said Akan Beyzade who owns a kiosk in Martin Place, not far from the siege. "US Consulate Sydney informs US citizens of a security incident involving at least one armed person at Lindt Chocolate Caf? in Martin Place in Sydney. New South Wales and Australian Federal police are addressing the threat. Please avoid the area around Martin Place until further notice. "US citizens are strongly encouraged to review your personal security plan, remain aware of your surroundings including local events, and monitor local news stations for updates. Maintain a high level of vigilance and take appropriate steps to enhance your personal security." 10:59am: This is the latest from James Robertson, our reporter in the CBD: A man who gave his name only as Bruno said he’d worked in the cafe for 6 months. "I was supposed to start at 10 am," he said while visibly shaken. That was about 15 minutes after the siege started and he was unable to get inside. 10:58am: Channel Seven’s Sean Berry has told ABC Radio’s 702 that police have asked them not to film, so their live coverage is no longer rolling. 10:56am: There are reports of an incident at the Sydney Opera House. A NSW police spokeswoman says the nature of the incident is not known, other than the fact that officers are there. From national security correspondent David Wroe: The flag being shown in the window is not an Islamic State flag, nor one for the other best-known jihadist group Jabhat al-Nusra. Rather, it appears to be a Shahada flag, which represents a general expression of faith in Islam, though has been co-opted by various jihadist groups. Greg Barton, a terrorism expert from Monash University, says that "getting hold of an [Islamic State] flag would be quite difficult, and people will make do with what they have got". That means it doesn’t help confirm or rule out that the hostage-takers’ affiliation is with Islamic State or any other group. Trains have resumed operating on the T4 Eastern Suburbs & Illawarra Line, however services are not stopping at Martin Place due to a police operation. 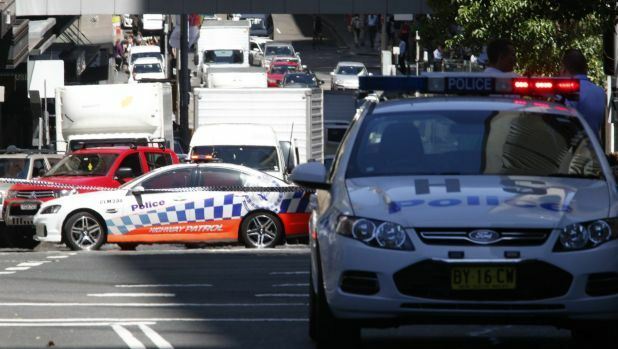 However, motorists and public transport commuters are still advised to stay away from the Sydney CBD. 10:37am: Here is the latest from James Robertson, our reporter on the scene. "About five uniformed and one plainsclothes police officers are on scene. A fire engine arrived at 10.15 am, a firefighter headed to the scene in full safety gear. 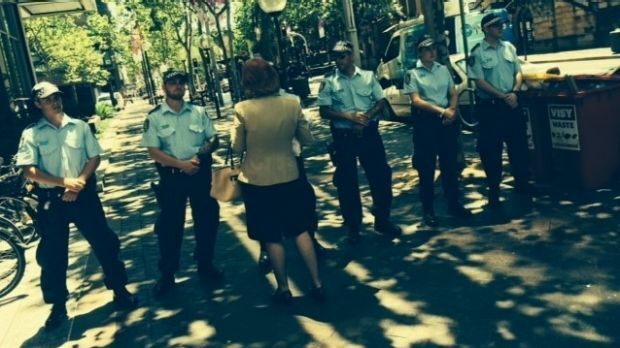 The police have just established an exclusion zone around Martin Place." 10:27am: This is what we know so far. A man armed with a gun has held up the Lindt Chocolate Cafe in Martin Place, witnesses say. There were also reports that a person was seen inside the cafe waving an Islamic State flag. There are 20 people inside the cafe. A NSW Police spokeswoman said officers were called to the shop about 9.45am on Monday, and there was a police operation under way. The Channel Seven newsroom, which faces Martin Place, is being evacuated. Hostages in the cafe could be seen standing beside the windows with their arms in the air. A large number of police are in Martin Place, and are telling people to stay away. Trains between Central and Bondi Junction have been stopped during the operation. Workers above the Lindt Chocolat Cafe in the Sydney CBD are evacuated with reports a gunman is holding 20 hostages.